On the morning of January 8, 1815, 2000 English Soldiers lay dead or wounded on a soggy, marshy battlefield six miles downriver from New Orleans. In a fight that lasted less than an hour, the Americans under Andrew Jackson had done the impossible and beaten the proud and powerful British army, touted to be the best in the world at that time. The Brits were well equipped, better supplied and had just defeated Napoleon’s massive well-trained army. On paper they should have smashed General Jackson forces, but they didn’t! Instead, they suffered a humiliating defeat and an unnecessary one. The Treaty of Ghent had already been signed on December 24, 1814, officially ending the war of 1812. The information had not reached American shores in time to prevent the battle. The Kentucky rifle played an important role in the victory at New Orleans and one of those rifles has survived, emerging during the bicentennial celebration of that battle to tell us its story. To this date, it is the only known verifiable, documentable longrifle that can do so. Owned by Robert and Linda Melancon, it is a national firearm treasure, eyewitness to an improbable American victory that birthed a new sense of national pride and patriotism. John Jacob Sheetz 1785-1860 was a well-respected and prolific gun builder that lived and worked in Shepherdstown, Virginia (now West Virginia). John and his brother Martin learned the gun building trade from their father, Phillip who apprenticed under George Unkafare of York County, Pennsylvania in 1760. Surviving firearms made by Phillip, John and Martin Sheetz exhibit excellent architectural design, mechanical dependability and artistic execution. Because this gun was built in Virginia and exhibits the regional design characteristics in the stock profile, metal engraving and stock carving it should be referred to as a Virginia Rifle. There were a number of these different schools of gun making in Pennsylvania (Lancaster, York, Reading, etc. ), identified with the Kentucky rifle. These schools were associated with the regions and/or the influence of the master gunsmiths where they were made. William Ross’s firearm is a great example of a Kentucky rifle made in what is known as the Golden Age. That is the period of time that Kentucky rifles reached the apex of their architectural design and artistic expression; after the American Revolution and into the first quarter of the nineteenth century. It is a .38 caliber flintlock longrifle in fine original condition, including the ramrod. With a simple repair to the weak sear spring, it could be fired. The 42 inch wrought iron barrel is rifled with a 1 turn in 36 inches twist and is clearly marked on the top flat with J. SHEETZ. In viewing the expertly carved, curly maple stock and the engraving on the patchbox, classic Virginia styling is evident. The forestock shows molding and incised carving running parallel to the barrel from the ramrod entry pipe to a point near the muzzle. To the rear of the cheekpiece are two C scrolls, placed back to back, utilizing a combination of raised and incised carving. Where the two C scrolls meet, a motif of a fan has been incised terminating with what looks like a pineapple finial. In front of the cheekpiece is another C scroll incised with cross hatching in the middle of it. Both the cheekpiece and the upper wrist area have oval silver inlays. The cheekpiece inlay is finely engraved, the wrist inlay is not. Between the end of the tang and the wrist inlay is an incised carving of a four-petal flower (identified as edelweiss). The brass patchbox is a typical Virginia style with a finely engraved (edelweiss) flower finial similar to the wrist. James Ross, William’s son and executor of his will, had the patchbox engraved in 1837 with the following inscription: “This rifle was used by my father Wm. Ross, member of Capt. Tho. Beale’s Company of New Orleans riflemen in defense of N. Orleans 1814-1815. James Ross 1837.” (2) Curiously, somebody crudely attempted to scratch William Ross’s name and the 1837 date off the patchbox lid but the remaining engraving can still be faintly read. No one knows who, when or why. Because of the role the Kentucky rifle played in that victory, it became immortalized in a popular poem written by Samuel Woodworth and set to music by Noah Ludlow in May 1822 at the French theater in New Orleans, Louisiana called The Hunters of Kentucky. “Ye gentlemen and ladies fair who grace this famous city, Just listen, if you’ve time to spare, while I rehearse a ditty; And for the opportunity, conceive yourselves quite lucky, For ’tis not often here you see a hunter from Kentucky. Chorus: Oh, Kentucky, the Hunters of Kentucky, We are a hardy, free-born race, each man to fear a stranger, Whate’er the game we join in chase, despising toil and danger. And if a daring foe annoys, whate’er his strength or forces, We’ll show them that Kentucky boys are alligator-horses. As a way to commemorate the bi-centennial of the War of 1812, the Contemporary Longrifle Association (CLA) has commissioned Darrin McDonal and Jim Parker to build a documentary copy of the Sheetz rifle. It will be auctioned off during the CLA’s annual convention in Lexington, Kentucky on Saturday, August 17, 2013. Jim Parker, from Warrior, Alabama, is a mechanical engineer by trade, who has completed 63 gun building projects. He built his first rifle in 1970 and enjoys building pre-Revolutionary War and Golden Age guns. He is a lifetime NRA member, a seven year member of the CLA, the FEGA and a longtime member of the NMLRA. Jim said that he studied the engraving on the original patchbox for months before he ever started work on the auction rifle. “I love Kentucky rifles and I enjoy history,” he said. “This rifle exudes the history of the actual making of our great nation; I could not walk away from an opportunity to recreate it.” Jim also donated the sterling silver for the cheek piece and wrist inlay for the project. Literally hundreds of hours have been dedicated to this project and every attention has been given to detail. Over a thousand pictures were taken during the building process. In trying to match the color of the documentary copy to the original gun stock, 25 different trial samples were made using leftover wood from the documentary copy for testing. For both of these gun builders, having the original one to refer to was a big asset. This was made possible by the gracious generosity of Robert and Linda Melancon. 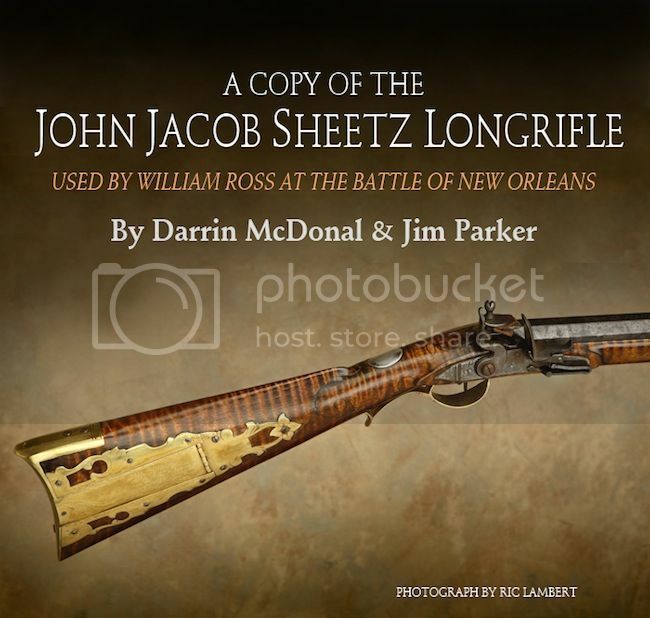 They acquired the Sheetz rifle in 1982 from the renowned Royal Street shop of James H. Cohen and Sons Inc. in New Orleans and their on-going research has shed much light on the rifle, its original history and its role during the battle of New Orleans. The following CLA members also graciously contributed to the Sheetz rifle project. Ed Rayl donated the barrel, Wayne Dunlop the stock blank, Mark Wheland inletted the barrel into the stock blank, Scott Pobjoy donated sheet brass and Reaves Goehring provided the buttplate and trigger guard. Jim Chambers donated the lock, and Jim Parker donated the sterling silver. Whoever has the winning bid will own an accurate, shootable replica of the rifle made by John Jacob Sheets and used by William Ross during the Battle of New Orleans. The documentary copy by Darrin McDonal and Jim Parker will be on display at the CLA Educational Booth during the 2013 NRA convention in Houston, Texas. The dates are May third through the fifth in the George Brown Convention Center.